Journal of the House of Lords: Volume 17, 1701-1705. Originally published by His Majesty's Stationery Office, London, 1767-1830. Sir H. Johnson versus Blake & al. Officers of Exchequer versus Sheriffs Bill. Sir J. Elwell & al. versus Collectors Bill. Dux Buckingham, C. P. S.
The Earl of Stamford reported from the Lords Committees, the Bill, intituled, "An Act for Sale of the Estate of Richard Ball, in Little Appulby and Great Appulby, in the Counties of Derby and Leicester; and for laying out so much of the Money as will purchase another Estate, of equal Value, to be settled to the same Uses, and the Residue in making Provision for Younger Children," as sit to pass, without any Amendment. Hodie 3a vice lecta est Billa, intituled, "An Act for Sale of the Estate of Richard Ball, in Little Appulby and Great Appulby, in the Counties of Derby and Leicester; and for laying out so much of the Money as will purchase another Estate, of equal Value, to be settled to the same Uses, and the Residue in making Provision for Younger Children." The Duke of Bedford reported from the Lords Committees, the Bill, intituled, "An Act to enable Sir George Warburton Baronet to sell the Manor or Lordship of Pulford, in the County of Chester, to perform an Agreement made upon his Marriage, for Payment of several Portions charged upon his Estate, and also to pay some Debts which his Father had Power to charge," as fit to pass, with One Amendment. Which was read Twice, and agreed to. Hodie 3a vice lecta est Billa, intituled, "An Act to enable Sir George Warburton Baronet to sell the Manor or Lordship of Pulford, in the County of Chester, to perform an Agreement made upon his Marriage, for Payment of several Portions charged upon his Estate, and also to pay some Debts which his Father had Power to charge." To return the said Bill, and desire their Concurrence to their Lordships Amendment made thereto. It is ORDERED, That this House will proceed to hear Counsel, for the Creditors and Legatees of the late Lord Lovelace, To-morrow, at Twelve a Clock. 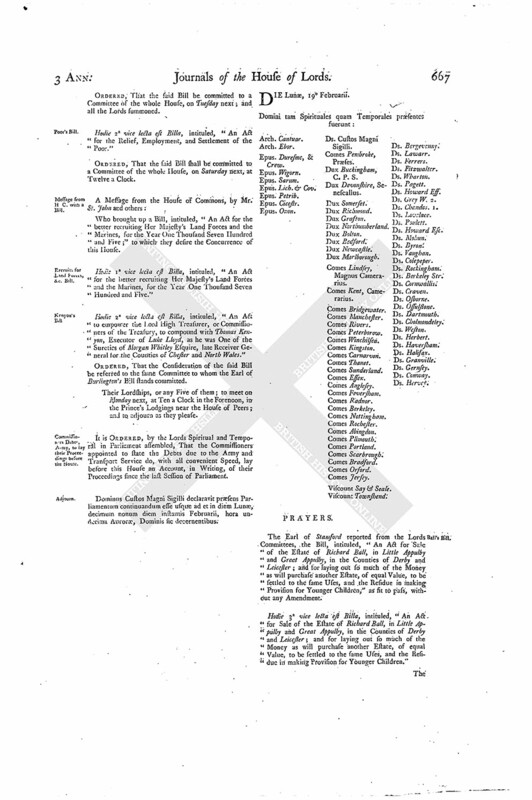 Upon reading the Petition of the several Officers in the Exchequer, concerned in passing Sheriffs Accompts; shewing, "That there is a Bill depending in this House, intituled, An Act for the Ease of Sheriffs, in the Execution of their Offices, and passing their Accompts; which, they conceive, is prejudicial to their Right and Offices, and tends to alter the ancient and approved Methods and Constitutions of the Exchequer; and praying, that they may be heard, at the Bar, or otherwise, before the said Bill do pass:"
It is ORDERED, by the Lords Spiritual and Temporal in Parliament assembled, That the House shall be put into a Committee upon the said Bill, on Friday next, at Twelve a Clock; at which Time the Petitioners shall be heard, by themselves or Counsel, at the Bar, what they have to offer relating to the said Bill. 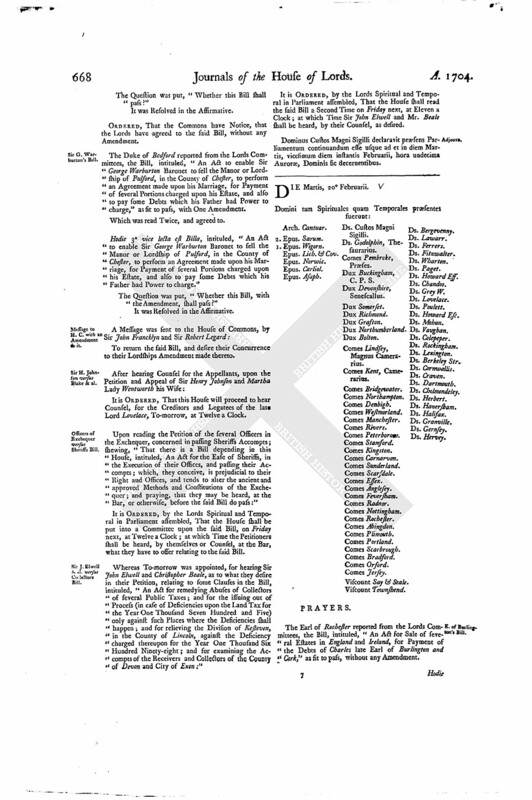 Whereas To-morrow was appointed, for hearing Sir John Elwell and Christopher Beale, as to what they desire in their Petition, relating to some Clauses in the Bill, intituled, "An Act for remedying Abuses of Collectors of several Public Taxes; and for the issuing out of Process (in case of Deficiencies upon the Land Tax for the Year One Thousand Seven Hundred and Five) only against such Places where the Deficiencies shall happen; and for relieving the Division of Kesteven, in the County of Lincoln, against the Deficiency charged thereupon for the Year One Thousand Six Hundred Ninety-eight; and for examining the Accompts of the Receivers and Collectors of the County of Devon and City of Exon:"
It is ORDERED, by the Lords Spiritual and Temporal in Parliament assembled, That the House shall read the said Bill a Second Time on Friday next, at Eleven a Clock; at which Time Sir John Elwell and Mr. Beale shall be heard, by their Counsel, as desired. Dominus Custos Magni Sigilli declaravit præsens Parliamentum continuandum esse usque ad et in diem Martis, vicesimum diem instantis Februarii, hora undecima Auroræ, Dominis sic decernentibus.